On Tuesday the 22nd of March 2016 in Cahir House Hotel, Cahir, Co Tipperary, Olivier ON4EI/EI8GQB gave a very interesting presentation to the members of the Tipperary Amatuer Radio Group. The topic of this presentation was on the use of green energy to power the contest station EI1A which is operated by Olivier in Fethard, Co Tipperary. This was an excellent presentation by Olivier which with the aid of slides and video footage, covered all aspects of contesting from the initial setting up of the station, antennas, equipment and to the operation of EI1A. Olivier travels to Ireland regularly from Belguim to Fethard to participate in various contests. IRTS President Ger EI8CC also attend this meeting and addressed the group on his capacity as president of our national society. TARG would like the thank both Olivier ON4EI/EI8GQB and Ger EI8CC for their attendance. 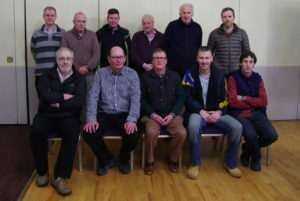 (standing) John EI7IG, John EI5HDB, Ronan EI5HRB, Paul EI3ENB, Eddie EI3FFB, Eoghan EI5HBB (seated) Andy EI5JF, Olivier ON4EI/EI8GQB, Ger EI8CC, Hugh EI2HI, Tommy EI2IT .